This podcast is now a janken sports anime podcast. This week we sound the Rohan midriff alarm. We spend five minutes talking about our Rohan/Jotaro detective AU. 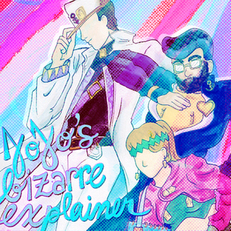 We experience all the beats of a JoJo's romance but... not. We determine that Rohan's only weakness is his fashion sense. And we make arbitrary decisions about the rules of ghost-ouija interactions.